Bruce Lee fighting in RFC Ram Charan, Rakul Preet Singh's action flick Bruce Lee directed by Srinu Vytla is progressing at brisk pace in Hyderabad. Filmmakers are shooting breathtaking action scenes in RFC with stunt master Venkat overseeing the action. 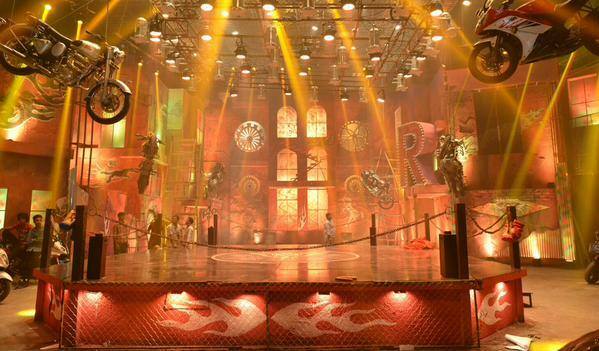 Shooting is in progress at Helipad Junction where Ram Charan is seen bashing the baddies without any break. Chiranjeevi will be doing special role in the film with Ileana sizzling in special number. Film stars Arun Vijay, Brahmanandam, Kriti Karbanda, Naga Babu Nadia, Tanikella Bharani, Mukesh Rishi, Rao Ramesh, Shayaji Shinde, Posani, Brahmaji and others. Thaman is the music director for the film produced by DVV.Danayya.